Every recruiter knows the value of being able to reach a candidate via InMail, and sometimes you need the extra boost of an email if you want to be sure your reach isn’t missed. However, a recent article on email marketing reports that 30% of professionals change their email address annually, and 17% of Americans create a new email address every 6 months. This makes it incredibly difficult to ensure you have the right information to connect. To solve this challenge, Connectifier is now tapping into the power of machine-learning AI and the LinkedIn API. The result is more candidate contact information at your fingertips and your odds of successfully contacting the right talent increases dramatically. Toggling between screens is a hassle, and that’s why we’ve made it possible to integrate your Gmail account with Connectifier. You’ll be able to track your responses and threads, just like you do with InMails. 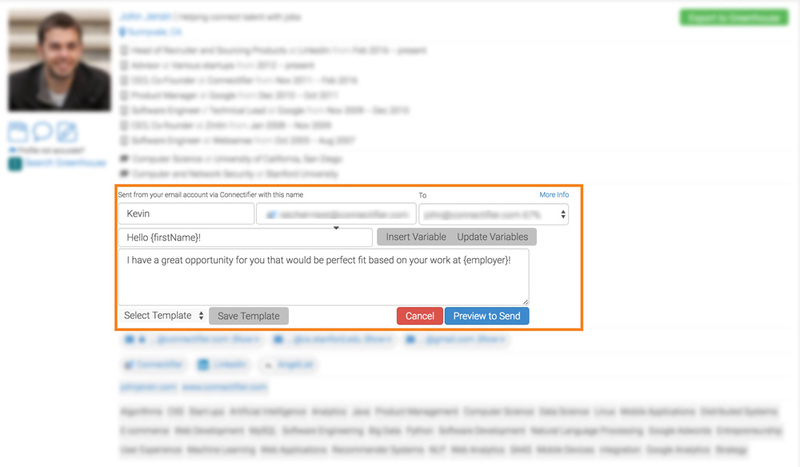 Additionally, when viewing a profile in Recruiter, you can send a message right from that screen, allowing you to take advantage of your message templates rather than having to start from scratch every time. These new features will be rolling out mid-October this year and we’re excited at the progress we’ve made in such a short time. The opportunities ahead are even bigger and we are looking forward to sharing more updates later this year. LinkedIn and Connectifier are making it easier than ever to quickly find and connect with the best talent and we are proud to be providing this solution to our customers. To speak to someone directly about Connectifier, contact us here.